Supercentenarian • Edna S. Decker became Jazz fan at age 101. Edna S. Decker, Utah's oldest resident, died Saturday at age 109 in Salt Lake City. Decker credited her longevity to good nutrition, a positive attitude and an independent spirit  she lived on her own in Sugar House until just six months ago, when frailty required a move to the Sarah Daft Home in Salt Lake City. But there was nothing wrong with her mind, said granddaughter Debra Anderson. Decker was still playing Skipbo, a card game she loved, days before she died, Anderson said. The supercentenarian said the best advice she ever had received was: "Live honorably, be honest and prayerful, and don't give up." Decker was born on Dec. 29, 1902, in Arnott, Wis., and outlived six siblings, including her twin sister, Ethel. She spent her childhood in Montana before moving to Utah. She had four children, 15 grandchildren, more than 40 great-grandchildren and at least one great-great-great grandchild. "There are no greater thrills than for a mother to hold her newborn babies in her arms and know they are all right," Decker said in a state yearbook profiling centenarians. "Then comes the joy of doing the same thing with new grandbabies." Decker went to work at Dunford Bakers, then located in Salt Lake City, when she was in her late 50s and spent 21 years at the bakery. If family was Decker's first passion, the Utah Jazz came a close second late in life. Decker became a fan of the team when she was 101 and rarely missed a televised game. At age 105, when The Salt Lake Tribune named Decker its "super fan of the week," she could recite all the players' names and the team's record. She also offered a pointed critique of then-coach Jerry Sloan, demonstrating how closely she followed the game. Decker loved to crochet. She made lap blankets for residents of senior care centers, who were all far younger than herself, until a few years ago, when failing hands and eyes made it too difficult to form the tiny knots. Decker said that after crocheting for so many years, she had finally become bored with it anyway, Anderson said. Decker outlived her husband, Elmer, by more than 40 years and was preceded in death by two of her children. Besse Cooper of Monroe, Ga., who will turn 116 in August, was believed to be the oldest living person in the world as of mid-April. 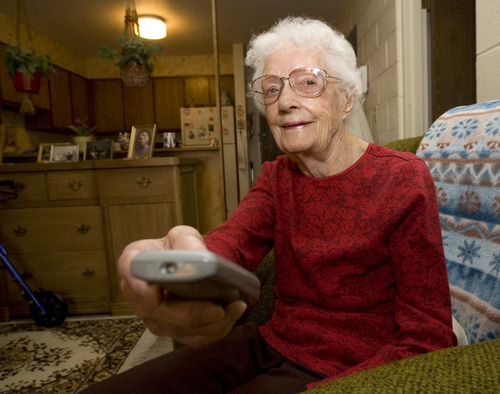 There are at least 155 Utahns over the age of 100, according to census data. The Utah Division of Aging and Adult Services has 143 residents on its list of centenarians, 45 of whom attended the annual party honoring the state's oldest residents last summer. Of those centenarians, 119 are women and 24 are men. The oldest woman in Utah now is Anna G. Mancuso, who is 107. The oldest man, at 104, is Eldred Smith.